Incredibly smooth and as easy to use as a pencil, the Turbo Carver II gives you the power to create beautifully detailed engravings and relief carvings in Wood, Gourds, Glass, Bone, Stone, Paper, Leather, Hard Metals, Eggs, Antler, Gems, and the like. If you can trace a line, using our stencil systems, training video and the ultra high speed handpiece you can create beautiful engravings and carvings with your first try. The biggest advantage is the price. Turbo Carver II is a complete package with hand piece, variable speed foot control, small particle air filter, inline air pressure gauge, training video, 2 burs, operators manual, bur catalog, sample of our peel off mylar stencil material, small brush and dust mask. Also available with 1/2hp tankless air compressor and foot operated electrical switch to operate compressor and Water Spray System. The Turbo Carver II comes with a 30 day money back guarantee,and a 6 month Manufacturers Defect Warranty. All regular rotary carving tools operate at low speed due to their motor bulk and friction armature restrictions. Slow speed handpieces use 1/8 inch diameter burs while ultra high speed instruments use 1/16 inch diameter dental burs. The slow speed hand piece is excellent for bulk or gross reduction where detail and precision is not a consideration. For engraving, doing fine details, or carving unusual materials such as glass, eggshells, and much more, nothing can beat an high speed air tool. What is a "High Speed Carving Tool"? High speed handpieces have a light weight turbine with a small diameter. Therefore, compressed gas can spin these turbines at very high speeds of 350,000 to 450,000 RPM. On the other hand, there is hardly any torque produced by these instruments, hence the ability to carve in extremely fine detail. The principal behind high speed instruments is angular velocity, not torque. The advantage of these instruments lies in their phenomenal ability to precisely remove material, without stressing you or what you are working on. These tools are not to be confused with "micro-motor" type tools, which have small handpieces but are motor driven. These high speed tools are driven by compressed air and operate at at least 10 times greater speed! Includes everything you need to get started including the Lube-free handpiece, a training video, 2 burs, (one carbide and one diamond) operators manual, bur catalog, sheet of mylar stencil material, dust mask, small brush, and the new Turbo Carver Air Compressor. It comes set up with a foot control, tubing, and an air gauge, ready to use with your Turboc Carver. Weighing only 16 pounds, and quieter than most compressors (about as loud as hair dryer), it is portable, easy to use and requires no draining or oiling as tank compressors do. Soft Ergonomic Handle (Grip) and looped airline are designed with total comfort in mind, allowing for a good solid grip on the tool. 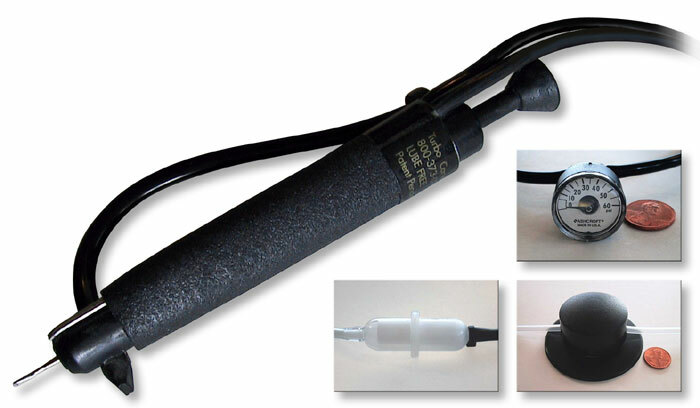 The rubberized surface does not get cold in your hand like the metal handpieces. 5 Micron Miniature Filter in-line with the foot control. This filter removes any particles that were not previously removed by the regulator filter on the compressor. 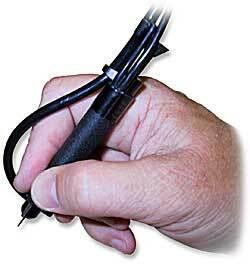 Miniature Air Pressure Gauge is located in-line with the hand piece tubing for the optimum regulator setting. Low settings produce poor performance, high settings could destroy the hand piece and you can't rely on the reading indicated on the regulator. Variable Speed Foot Control with lifetime warranty, allows you to vary the speed so that you can use low speed grinding burs as well as high speed cutters. Click on the photos for a larger view! 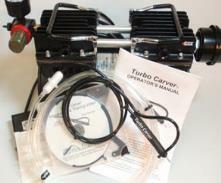 To save on shipping, all Turbocarver units are sent to you directly from the manufacturer. Unless otherwise requested, your instructional video will be in DVD format. Please contact me to order or obtain additional information. ...450,000 rpm and totally lube free! There are several different tools available, and each has its own advantages and disadvantages. Some air tools are actual dental handpieces and are fine pieces of machinery. These tools are of a very high quality and are very durable, but they also carry a higher price tag. Other models are designed for hobby and crafting uses and cost much less, but they are not intended to endure heavy duty professional use. Only you know your own interest, carving level, hours of use and budget concerns. If you are interested in a high speed tool for fine detail work, be sure to read all of the information carefully to select the tool that meets your needs. For years, I have offered the Turbo Carver, which is the smallest, lightest air tool on the market. This tool also has the advantage of being lube free, which means the sealed inner bearings do not require oiling. The Turbo Carver is also one of the lowest priced tools available and is suitable for light users that are on a budget. Read below to find out about the features of each tool. 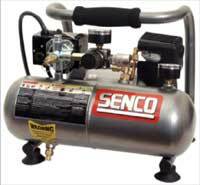 Is a complete package with includes everything you need to get started using your own air compressor. (Any compressor rated ½ horsepower or over will provide sufficient air to operate the Turbo Carver II.) Lube-free handpiece, variable speed foot control, small particle air filter, in-line air pressure gauge, training video, 2 burs, (a 699 carbide and a MM5 diamond) operators manual, bur catalog, sheet of mylar stencil material, small brush and dust mask. Shofu oil-free high speed handpiece Includes a protective storage case. Regulator: The kit features an air filter/pressure regulator with moisture trap, to deliver clean (5 micron), moisture free, pressure controlled air to the turbine. The regulator takes a maximum of 150 psi on the inlet side. Regulator Stand: The regulator is attached to a stand made of solid poplar. Holes have been cut in the top of the stand so you can place the bits you are using on your current project. It has a moisture resistant finish. Variable Speed Foot Pedal: The foot pedal is one of the great features in the kit. This dental foot pedal is air operated. The harder you press down on the foot pedal the higher RPM you will be running. Simply ease up on the foot pedal to slow the rpm for delicate carving. Owners Manual & 1 hour DVD: The DVD is one hour of instruction. You learn the different techniques used when engraving in: Wood, Glass, Egg. and hints for using appliqué film (stencil film), plus a full section on setting up your equipment and getting started. I recommend you watch the DVD before you get started. 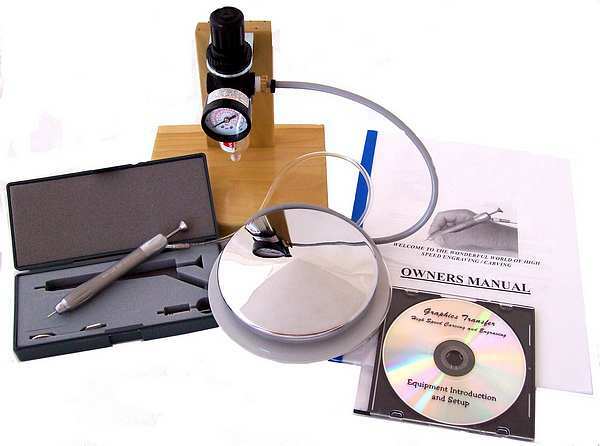 The owners manual offers photos and instructions for use, maintenance and bit identification. Note: This kit does not include an air compressor. Many people already own a compressor that will run the tool. Shofu uses a little less than 1cfm @ 32psi. A small compressor (with an air tank) rated for at least 1cfm @90psi will easily run the tool, or you may also use your much larger garage compressor. 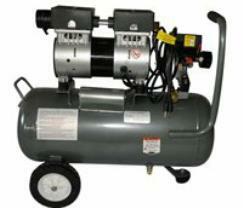 However, if you do need to purchase an air compressor we can provide you with guidance or sell you a good one. Send us an email for more information. The Shofu Carving Tool is the work horse of high speed carving and engraving equipment. The Shofu is a dental lab hand piece, used in dental labs across the United States and many other countries, 8 hours a day, 5 days a week. The Shofu handpiece is all metal, inside and out, and maintains high torque and dependability at very high speeds. When working in hard woods, the Shofu has much more torque allowing you to carve quicker. 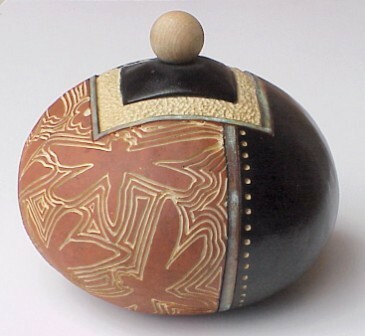 The Shofu is oil free which means the inner bearings do not require oiling, a big plus for gourd & wood carvers as there is no messy oil spitting onto your work area. The Shofu has a lightweight well balanced construction for maximum hand comfort. 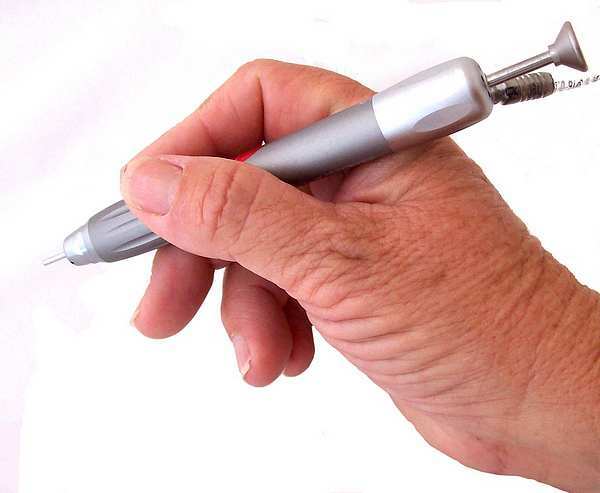 Ergonomically designed for extended usage, it feels like holding a pen, with no chatter or vibration. It features one handed bit ejection, simply push down on the plunger and the bit is ejected. No twisting or tools required. The Lab AirZ is not a hobby tool, it is a lifetime pieces of equipment. After the 90 dayr full warranty is up, all parts in the handpiece are replaceable and or rebuildable. The Shofu (Lab AirZ) Dental Lab Company has been around for 90+ years. This is the same tool used by Bill Janney in his book “Gun Stock Carving by Bill Janney”. If you shop around, you will realize you can't find a better price on a quality tool. QUIET Another great feature for the Shofu is how quiet it is when turning at 360,000 RPM. When prospective customers first hold the tool for a demonstration, they often ask if the tool is actually on. That is how smooth & quiet this tool runs! Use the Bur Catalog to order burs individually. This package includes a nice assortment of some burs I like. These will meet your needs for almost any gourd carving application. In addition, I am now offering the Shofu Lab Air-Z, a high speed Engraving/Carving Tool which is made for the dental industry. This is a professional quality, ultra quiet, precision instrument that will hold up under long hours of use. Using a high speed tool is like drawing with a pencil. With a little practice, you can get some great results. 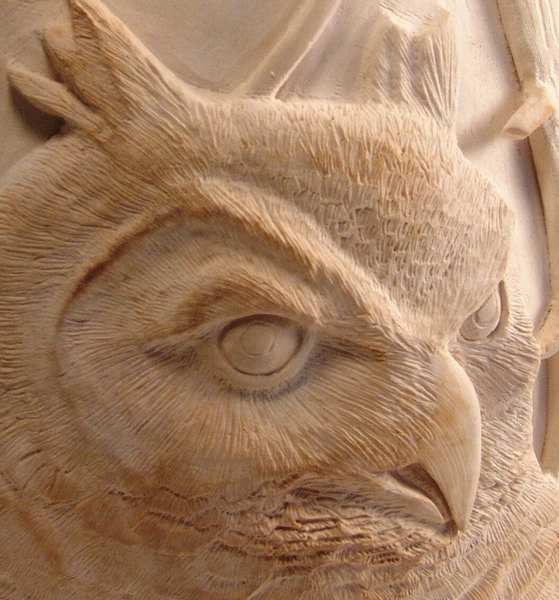 All of the dragonfly outlines and of the all detailing on the owl head were carved with an air tool! The Shofu tool works best with a compressor that has a small tank. This reduces the amount of water in the air lines. (Water is a natural byproduct of compressing air). This 1 HP California Air Tool compressor has a 6.3 gallon tank to deliver plenty of air, and it is ultraquiet. (It produces approximately 3X the air of the Senco motor shown to the right.) The compressor weighs 49 lbs. but has wheels so it is easy to move. Delivers 3.80 CFM @ 40 PSI 2.35 CFM @ 90 PSI, is oil-free, and has a one year warranty. For the budget minded: This small Senco compressor is reasonably priced, lightweight and quieter than many of the compressors sold at big box stores. The compressor weighs 20 lbs. and is easy to carry. It has a one gallon tank, and carries a one year warranty.